It’s our retreat month, so the Centre is closed to the public ~ you’ll need to contact Amitabha Centre if you wish to go to there during the retreat. We’ll be open again on 30th January. *Sorry, it’s too small to read. 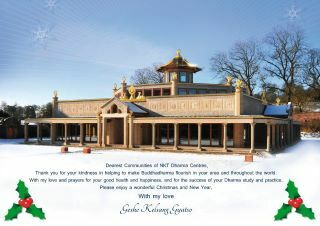 But Geshe la wishes us a Happy Christmas and New Year; and thanks us for our kindness in keeping Buddhadharma alive in this world.